For this challenge, I want you to abstract the following record from the first book of Essex County deeds. (Click on the image to enlarge, or click here to view the original TIFF image.) For extra credit, make it a complete transcription. Ah, yes! Early Essex researchers praise the General Court for mandating good records and curse Hillyard Veren for the worst handwriting this side of Lands End. I don't have time to puzzle it all out, but here's a quick read. Edward Norris Minister and teacher to the ?????? 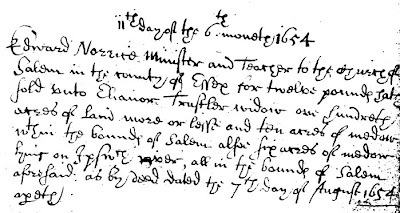 of Salem in the county of Essex for twelve pounds late Sold unto Elianor Trustler (?) widow one hundred acers of land more or less and ten acers of medow within ine bounds of Salem also Six acers of medow lying on ????? [Ipswich?] river, all in the bounds of Salem aforesaid, as by deed dated the 7th day of August 1654 ????" This "secretary" hand is one of the banes of my genealogical existence, I fear. I'm not sure of Eleanor's surname. I can't figure out the words with ??? as letters above - if I knew the area I might have figured out the river's name - it might be Ipswich. Frankly, I think that this has been transcribed somewhere but I didn't bother to look for it. I'm sure you will correct my work here. Have at it! This one is easy. It looks just like my handwriting! Edward Norris, Minister and Toreador leaves 12 pounds of truffles to his fox Eva and two modems to his buddies at Salon. "This estate has interesting reminiscences. It was an original grant in January, 1640, to Edward Norris, at the time of his settlement as pastor of the First Church in Salem. He sold to Eleanor Trussler in 1654." Edward Norrice Minister and Teacher to the church of Salem in the county of Essex for twelve pounds hath sold unto Elianor Trustler widow one hundreth acres of Land more or less and ten acres of medow wthin the bounds of Salem also six acres of medow lying on Ipswich river, all in the bounds of Salem aforesaid as by deed dated the 7th Day of August 1654"